QuickNAV uses the latest technology from VMT using their Transport Canada approved RADAR GPS Simulator NetSim. This invaluable course will save Time, Stress and Fuel. This course will introduce you to Global Positioning System (GPS) receivers. You will learn the system which makes GPS such an effective navigational tool as well as invaluable methods for learning to maximize the navigational information from your equipment. Learn to plan your course, improve position, and understand real time speed/direction data to improve your boating safety and cruise enjoyment, and as you reduce travel time you will reduce fuel consumption. NetSim incorporates an un-stabilized radar. Crews can use the radar to practice navigation and collision avoidance. Radar functionality includes variable range markers, electronic bearing lines, gain control, sea clutter and rain filters. NetSim incorporates a north-up chartplotter. Crews learn to use the chart plotting system to practice navigation and route planning. Chartplotter functionality includes GPS integration and way-points and route setting. NetSim incorporates a standard GPS configuration. Crews can use the GPS to practice position fixing. GPS functionality includes road, bearing and time-to-go displays as well as HDOP, Datum, GPS & DGPS position accuracy. 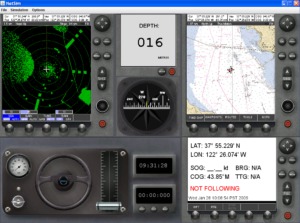 NetSim incorporates a magnetic compass as an independent navigation tool. Crews can rely on the magnetic compass should the training scenario simulate GPS failure. Email Us – get your place on the wait list, seats are limited!